Visiting the White House was only part of the Washington, DC Soldier Ride, though it maintained a proud tradition among United States presidents that began in 2008 with President George W. Bush and continued through 2016 with President Barack Obama. WASHINGTON (April 24, 2017) – When Army veteran James Myers first connected with Wounded Warrior Project® (WWP) three years ago in Hawaii, meeting the president of the United States was not something he expected to happen as a result. James recently joined 53 other wounded veterans in the East Room of the White House, to be greeted by the president, vice president, and the first and second ladies. 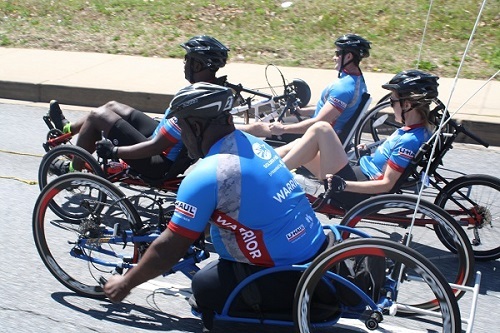 The special ceremony was part of Soldier Ride®, a multi-day bicycling event that connects warriors with one another to help heal their bodies and minds. Visiting the White House was only part of the Washington, DC Soldier Ride, though it maintained a proud tradition among United States presidents that began in 2008 with President George W. Bush and continued through 2016 with President Barack Obama. The day before, James pedaled alongside his brothers and sisters in arms through Annapolis, Maryland, and around the United States Naval Academy. This feeling was shared by another warrior on the ride, Laura Herbst-Agee, an Air Force veteran from York, Pennsylvania. She was one of three warriors from York, who came to Soldier Ride not sure what to expect. In a WWP survey of the injured warriors it serves, more than half of survey respondents (51.7 percent) talked with fellow veterans to address their mental health issues. 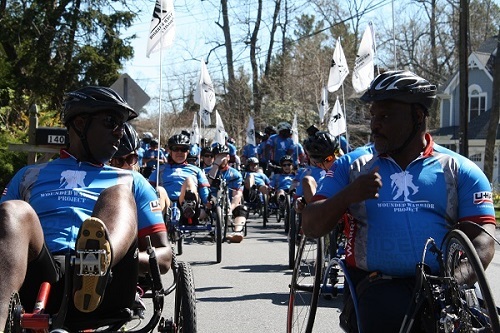 Soldier Ride doesn’t just push warriors physically – it challenges them to come out of isolation and approach their roads to recovery as a team, side by side with their fellow wounded veterans. To learn more about how WWP’s programs and services connect, serve, and empower wounded warriors, visit http://newsroom.woundedwarriorproject.org/. To find photos from this Soldier Ride, click on multimedia, then images.